His stark resemblance to the Hollywood super star Bruce Willis aside Daryl Harper was one of the colorful umpires to have umpired the game. Although he had to retire five shy of a 100 Tests he gave his fair share to the game. It was indeed disappointing for him that he had to quit before reaching a century under controversial circumstances. In a candid interview with CricketWeb he shares his thoughts about various things, cricket, baseball and life in general. A relative in my family was a Test umpire in the 1950’s in Australia. He married my mom’s cousin and was a great big tall guy, six foot five inches tall. He umpired sixteen Test matches in the 1950’s. When I was a young boy, I used to see him at family functions and listened to the stories that he’d tell. I’ve got a bail as a souvenir from him that was used during the series when the West Indies visited Australia in 1951-52, and that’s how I was motivated and developed a liking towards cricket umpiring. His name was Mel McInnes. He was probably umpiring just before Colin Egar became Australia’s leading umpire. Unfortunately, Mel finished his career in a disappointing way. He found himself in the wrong position with a substitute runner…between the stumps and the substitute runner in what turned out to be his last Test match. Mel made his decision, and I believe he got it wrong and was roundly criticized in the media. That turned out to be the end of his Test umpiring career. Have you played cricket at any level? I played club cricket. I grew up in Adelaide and played club cricket for a team called East Torrens, The club captain was a man by the name of Les Favell. Les played 19 Tests for Australia in the 1960’s, including the tied Test in Brisbane. He toured India and made his only Test hundred in Chennai. Your first First-Class match as an umpire? It was in November 1987 and it was the touring New Zealand team playing South Australia in a four-day game. Jeff Crowe was the captain of New Zealand. His brother Martin Crowe was playing, Ian Smith and Richard Hadlee were playing too. I took a bit of criticism from them from time to time. In fact, Martin Crowe suggested that I keep the match ball because I would never get appointed to another game of cricket after that game. Your first Test series as an international umpire? My first test match was the Second Ashes Test of 1998-1999 and that was in Perth. Australia beat England in two and a half days. I just remember that I was an incredibly nervous umpire in my first Test match because I’d always hoped that I would be able to umpire a Test. I just wanted to see what the experience was like, and here I was umpiring England versus Australia in another pinnacle – an Ashes Test match. Mike Atherton and Nasser Hussain were playing for England and Steve Waugh and Mark Waugh played for Australia. As it turned out Damien Fleming took a lot of wickets. He took five wickets in the first innings and four in the second and England was soundly beaten in two and a half days in a very shortened game. A lot of catches were made in the slips and caught behind on that bouncy WACA wicket. England just couldn’t handle it. But I was lucky enough to get a second Test, and it was the Boxing Day Test in 1998. The only time I umpired a Boxing Day Test was my second Test match, and England won that one in quite controversial circumstances when Australia needed to make 175 to win in the fourth innings, and at the end of the fourth day they opted to have the extra half an hour to get a result. They only needed thirty odd runs and they were seven wickets down. Steve Waugh, the batting captain said, “We want to go for an extra half-hour, eight more overs,” and it backfired on them because they lost. Then I think England won that test by 12 runs. Steve Bucknor was my partner. I was really excited to do a game with him because I had seen him on TV for many years and I admired his style. Well, they changed the rule since the technology showed that most bowlers were chucking the ball. They changed the rules to accommodate everybody, I think in the Champions Trophy in 2004 in England, they filmed 23 bowlers without them knowing it and they believed that 22 of them were throwing the ball under the laws of the day. This was the early research before they changed the rule. They then realized that there had to be some sort of a tolerance to the number of degrees that they could be allowed to straighten, otherwise it was a farce because everyone was basically throwing the ball. Initially the tolerance was 5 degrees, until eventually it was extended to 15 degrees. Top batsman and top bowler? I would have to say Sachin Tendulkar was the most outstanding batsman I have ever seen, because I always knew that when he came to the wicket, if I thought I was concentrating, I had to concentrate even more because the whole world was watching Sachin. That man carries so much pressure on his shoulders. How he survived for so long at such a high level is a miracle. He is unique, he is freakish, because a normal person shouldn’t have to carry the hopes of a nation like that. The most outstanding bowler I have seen is probably Shane Warne. I have to say that he is the best in his art, absolutely the best in his art. Of course he is the reason why I didn’t get invited in IPL 4, because I sledged him apparently and he wasn’t happy. (laughs). How do you stay focused during the five days? Yes, it’s a tough ask. Sometimes you get an innings that is so outstanding when the batsman is never going to get out, Sachin has played a few of those, so has Lara. Brian Lara was just poetry and he was amazing. Sometimes I probably found myself just gazing in admiration on such knocks. But there’s always been the fear of failure, fear of seeing your name in the paper. 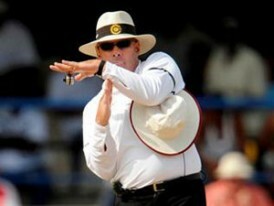 That’s what draws umpires to work hard. How about criticism and how do you take it in your stride? Well, first of all there hasn’t been an umpire yet who hasn’t made a mistake. From July 2008 to June 2010, a two-year period, I was the most accurate decision-maker in Test cricket according to statistics taken over the period before and after I had the Johannesburg Test. And yet the English media wrote some very defamatory comments. Though what they weren’t aware of was that there are twelve umpires on the panel and no umpire, not Simon Taufel not Aleem Dar, no one was more accurate than I was. But no one comes out with those statistics, the ICC never publishes them. They provide it to us as feedback at the end of the season and nothing is done with them. The English media has always been super critical, and I’m still hoping I can enlighten some of them through a legal recourse (laughs). I think they are brilliant, absolutely brilliant they play the game precisely in the right spirit. I would be lying if told you that I didn’t take advantage or make use of that fact. Lara, Gilly and Shiv Chanderpaul are a few to name. It’s not the avenue that I would have chosen – a sport like baseball, MLB baseball, with a fairly high turnover in dollars, doesn’t use the equivalent of the DRS. It does [work] in some ways, but in other ways it doesn’t. For example in my last Test at Sabina Park, I gave two batsmen out and I know they were out but the technology that was in use during that game was not good enough to show it to confirm the touches that I saw and heard. One was angled down the leg side where the ball came off the glove, quite clearly nothing else, caught behind, big appeal and he wasn’t happy but he was out. The other one was Suresh Raina and it definitely touched the underside of the glove, probably clipped his leg and popped up and he was out. The technology in 2011 is not of accurate enough quality, to confirm either of those decisions as correct or incorrect. The lack of slow-motion cameras plus no frame by frame to confirm it, so what people have to realize is frame-by-frame photography has the ball with the quick bowler traveling between 120 and 130 cm between frames. It’s a long distance. If it’s a slow bowler it is more like 60 cm between frames and Hawk Eye is animation, it’s no more than a cartoon. We Have not got 100% technology and the requirement is to refine what they are developing and get a better system. I think we have gone so far down the technology route that we need to keep going that way. We can’t stop as it is potentially a great tool, it is certainly great entertainment and people accept it as 100% whereas it is not exactly 100%. What’s the best Test match you umpired? 2008, England vs India in Chennai, immediately after the Mumbai 26/11 attacks. There was a lot of emotion, 174 innocent people had been killed, India as a nation was stunned and the cricket was played then at Chennai and it was a marvellous game between two top sides – Sachin turned the ball down to fine leg to bring up his 42nd Test century and the winning runs. It was a very emotional one, also the emotion was just simply because the whole country came to a standstill as there was a lot of outrage in the media about the terrorism. It was pretty significant, and people were highly offended at the thought that their main city had been under attack by ten or twelve infiltrators (I’m not sure what you call them). The whole attack was disgusting, depressing and distressing, and to umpire a Test match and get a result that went India’s way, I just thought that must have been a good lift for the whole nation so that is the most emotional one I can recall. How about being a Red Sox fanatic? Back in Australia they had a night baseball competition in the 1960s, and my local team was called the East Torrens Red Sox. I discovered in the papers that there was a team in America called the Boston Red Sox, so they became my team, I’ve followed them since the mid-1960s. I would follow them in the ’60s, ’70s and ’80s in the paper. During the ’90s internet came into fashion and I used to log on and find out what they were doing. By 1999 I started subscribing to MLB.com. In the last eight years I have them as my home page. I turn my computer on; Boston Red Sox are ready for me. I’ve watched hundreds of games. There are a lot of similarities between cricket and baseball, especially now we have got the T20 cricket. That is the closest you will get to a baseball game. Two to three hours, all action and entertainment, I just love the duel between the pitchers, I love the fielding skills, the batting skills and there are so many skills that cross-over from one sport to another. Back in Australia I’m going to take up baseball umpiring, just as a hobby. I’m not seeking to go up the MLB level! I just want to experience what it will be like in another game that I have great passion for, to see what the ball is like when it’s coming towards me instead of going away from me. I have a book planned too – I know what I want to write about and I am keen to do it myself. I think I could write something entertaining, factual and a little bit provocative and thought provoking as well. Regrets… there could be many – I regret that I wasn’t a better player (laughing). Yeah, I’ve enjoyed being part of the system for a long time, I enjoyed a lot of reward from it, I’ve met some wonderful people, I’ve seen some brilliant cricket and it has just enriched me as a person mixing in all these different cultures. I’d never have gone to India, Pakistan, Sri Lanka or Bangladesh without cricket. I’ve got some wonderful friends in all those places and it widened my horizons and made me see that there’s more to life than just living in a small city in Australia. I think I’ve travelled overseas 80 times now. That’s a lot of overseas travel, and it’s a lot of people I’ve met and a lot of cricket I’ve seen too. How lucky can a person get? Yeah, good read, thanks. Interesting re his thoughts on technology. Pretty good read. Interesting to read about his thoughts on baseball. Made it onto Cricinfo as well. Great interview. Really interesting and refreshingly frank. Thumbs up!!! [QUOTE=rvd619323;2628823]Pretty good read. Interesting to read about his thoughts on baseball.